Daily outfit: Harry Potter and the Deathly Hallows. On Saturday evening, Ross and I traipsed to the cinemas to see the long-awaited final film in the Harry Potter series. I realise that there are probably many of you who haven’t seen the film yet, so I should warn you that there are some spoilers in this post. 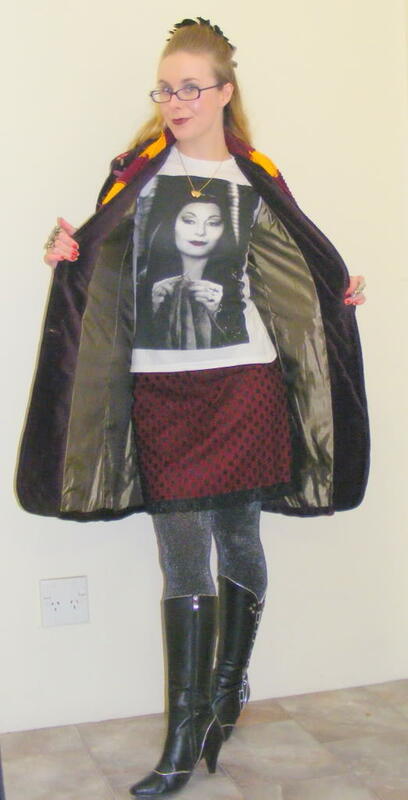 In the interest of not wreaking the film for anyone, I’m going to do my outfit post and then I’ll talk about the film. That way you can bask in the glory of my outfit without worrying that you’ll expose the ending of the film. So now, my outfit. I am a massive Harry Potter nerd, and as such, I decided that I needed an awesome outfit to wear to see the movie. I chose something that was heavily inspired by the aesthetic of the film, with heavy fabrics, big boots, chunky jewellery and, of course, a scar. My mum bought this jacket for me at a clearing sale a few weeks ago, and I am head over heels in love with it. I thought that it looked like something that Dumbledore would wear, with the heavy tapestry look and the funky appliqué. 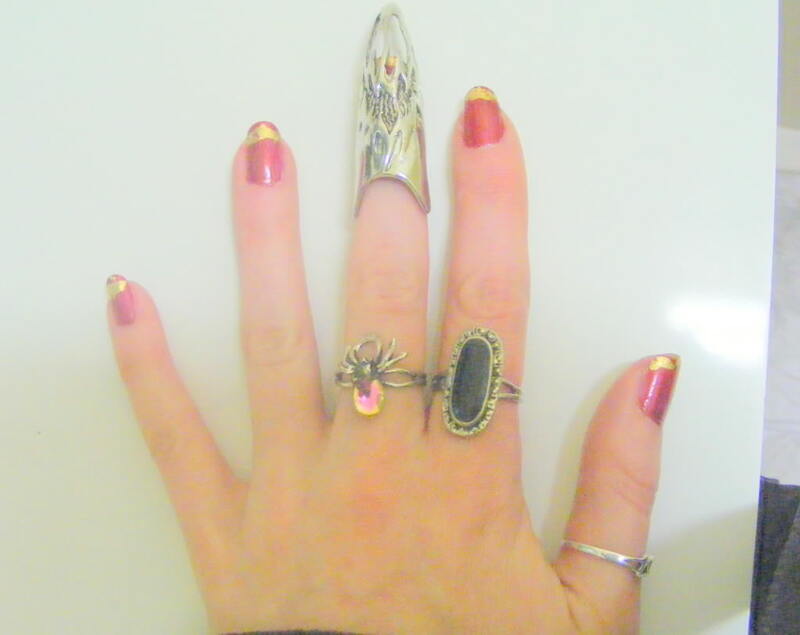 I painted my nails a regal shade of burgundy and then applied gold foil to the tips for a Gryffindor-inspired look. 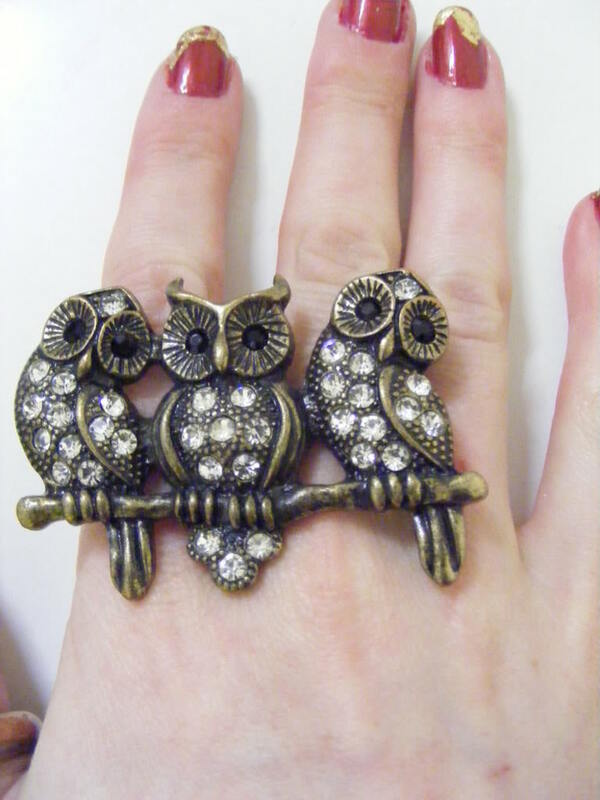 I piled on a number of rings- a claw-shaped fingertip ring, an owl ring (to represent Hedwig), a snake (to represent Nagini) and my silver ‘love’ ring. 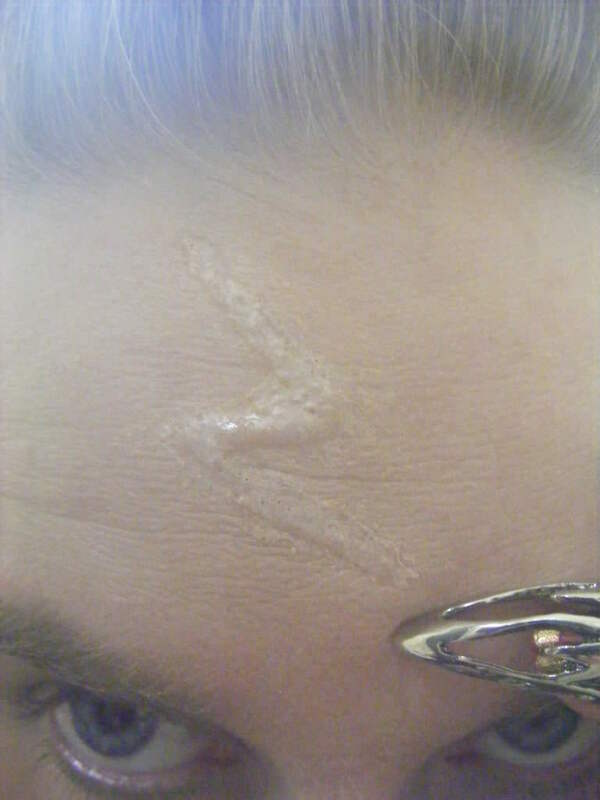 I did my scar a little differently to Harry’s. Harry’s scar is red and angry looking, like a fresh wound. I decided to go for something a little more subtle, so I shaded the scar with white to make it look like it had been healed for a while. 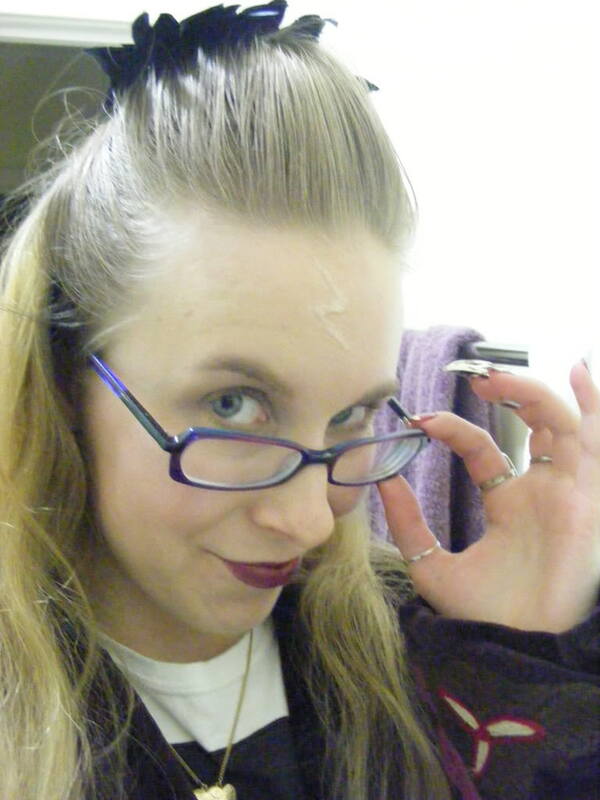 It still looked really effective, but not as obvious as painting a honking red scar onto my head with lipstick. If you’re interested in seeing how I made the scar, let me know. I’m thinking of doing a quick tutorial if you guys want to try it for yourselves. So now, let’s talk about the movie. If you haven’t seen it yet and you want to be surprised, don’t read the rest of the post. I thought that the beginning of the film moved very quickly. After the first couple of scenes had flown by, I wanted to scream, ‘Slow down!”. I was a bit worried that some of the more important scenes would be rushed and the detail would be lost. My fears were unfounded though. I thought that the film was well-paced, with plenty of time devoted to the most vital parts. The film coped well with the plot holes that were left by the sixth film. I thought that Harry Potter and the Half Blood Prince left out a lot of vital information. The Deathly Hallows Part 2 filled these gaps reasonably well, and the story reached the same conclusion as the book. Some scenes from the book have been omitted, but nothing vital has been left out. The most important scenes, including the deaths of Snape and Harry, were incredibly well rendered. Alan Rickman deserves an Oscar for his performance as the greasy, long-suffering potions master, and I actually had tears running down my face when he met his end. The scene in Kings’ Cross station was similarly moving, and adhered well to the book. The love scenes were a bit patchy and stiff. Like the previous films, the kisses between Harry and Ginny are perfunctory and awkward, and there doesn’t seem to be any real passion there. You don’t really believe that these two are as madly in love as the story tells us they are. On the flipside, the eventual kiss between Ron and Hermione is filled with love and longing. These two share many tender scenes in the remainder of the film, which I found rather touching. By and large, my favourite part of this film was seeing Neville Longbottom finally get his moment in the sun. Neville is tougher than leather in this instalment, taunting Death Eaters and blowing up battlements. He even leads an impassioned speech against Lord Voldemort. Other highlights of the film for me were Professor McGonagall’s use of the “piertotum locomotor” charm, watching Ron pretend to speak parseltongue and the mega-awkward hug between Draco Malfoy and Lord Voldemort (seriously, I was in stitches watching this). The one bone I have to pick with the film was the ending. I really hated the ‘nineteen years later’ ending in the book, and it really was no better in the film. I always thought that this ending seemed rushed and disconnected with the rest of the story. It’s too cheesy and obvious for my tastes. This scene in the film seems similarly rushed. Although films like The Curious Case of Benjamin Button have shown us that an actor can be convincingly aged with makeup, these techniques have not been applied in The Deathly Hallows. The young actors resemble kids dressing up in their parents’ clothes, and do not actually appear any older. I felt that this scene could have been done a lot better. Overall, I really loved this film. It was touching and action-packed, with some excellent comic relief. A word of warning: this is not a film for children. If you’ve got kids of your own, or nieces and nephews that want to see this film, I would advise against it. This instalment of the Harry Potter franchise is much darker and significantly more violent than it’s predecessors. There are some rather disturbing scenes which would be distressing for children. In particular, Snape’s brutal death and the flayed remains of Voldemort’s soul in King’s Cross station had even me cringing in my seat. I don’t recommend taking young children along to see this film. Do them a favour and make them wait until they’re old enough to appreciate it. Have you seen Harry Potter yet? What did you think?